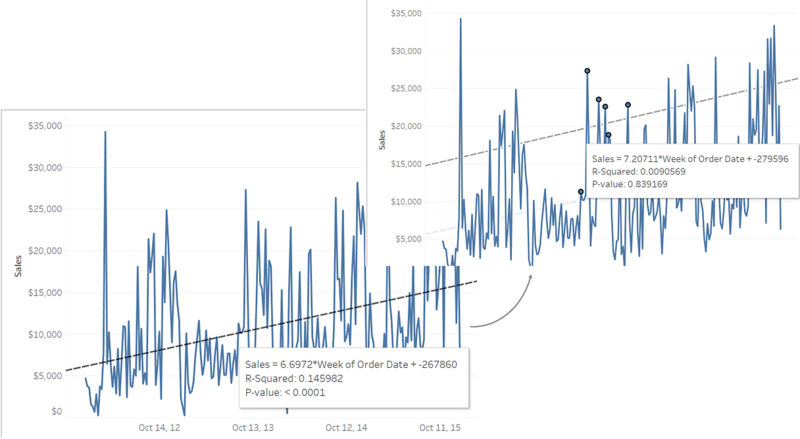 When you are ready to explore and analyze your view, Tableau offers a selection of dynamic data inspection tools that help you isolate the data of interest. For example, if you have a dense data view, you can focus on a particular region, select a group of outliers, and view the underlying data source rows for each mark. 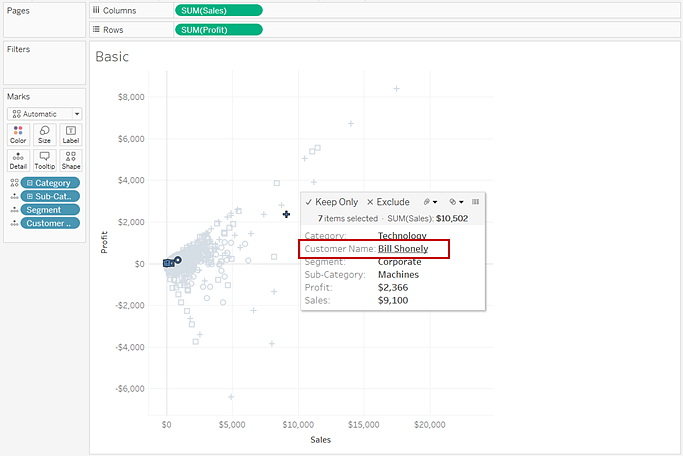 Watch a Video: To see related concepts demonstrated in Tableau, watch Getting Started with Visual Analytics, a 6-minute free training video. Use your tableau.com account to sign in. The simplest way to add highlighting to a view is to select the marks you want to highlight. When you manually select a mark in the view, all other marks are dimmed to draw attention to the selection. Your selection is saved with the workbook. For more information on how to use selection tools, see Select Marks. Also see Legend Highlighting, Highlight Data Points in Context, Highlight Toolbar Button, and Highlight Actions. You can select multiple marks by holding down the Ctrl key on your keyboard (Command key on Mac) while you select each mark. You can also use one of the advanced selection tools to select marks within a specific shape. You can also select marks and headers to filter what is being displayed in the view. For more details, see Select to keep or exclude data points in your view and Select headers to filter data. When you select one or multiple marks in a view, and then continue to hover in the same spot, several options for inspecting your data are available in the tooltip. Keep only the selected marks in the view. For more information, see Select to keep or exclude data points in your view. Exclude the selected marks from the view. Create a group based on the selected marks. For more information, see Correct Data Errors or Combine Dimension Members by Grouping Your Data. Create a set that contains the selected marks (Tableau Desktop only). For more information, see Create Sets. View the underlying data of the marks selected. For more information, see View Underlying Data. For related information on Tooltips, see Tooltips. For details on related analysis tools, see View Toolbar, Select Marks, Pan and Zoom, Undo and Redo, and Drop Lines. If you include discrete (categorical) dimensions or measures in your tooltip, you can use them to select marks in the view that have the same values. If Tooltip selection is turned on for your worksheet, then these fields show as underlined text when you mouse over them. Clicking on the tooltip selects all the marks in the view that have the same value. 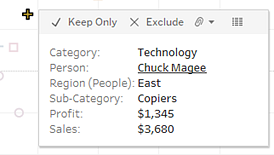 In the example below, when you click on Bill Shonely (the value for Customer Name) in the tooltip, any mark in the view that also includes Bill Shonely as a customer is selected and all other marks are dimmed. To turn this functionality off or on, select the Allow selection by category check box in the Edit Tooltips dialog box. For more information about setting tooltip properties, see Add tooltips to marks. 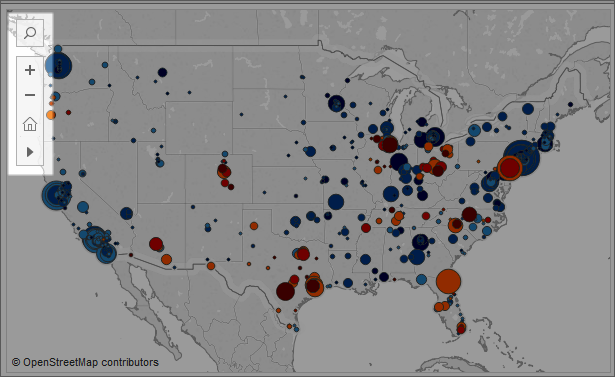 Tableau maps can help you quickly find locations and analyze data worldwide. There are many ways you can explore and interact with map views. You can zoom in and out, pan, and select marks with the view toolbar, and even search for locations worldwide with map search. For more details, see Explore Data in Maps , Search for Locations in Your Map, and Measure Distances Between Data Points and Locations in a Map. Drag reference lines, box plots, trend lines forecasts, and other items into your view from the Analytics pane, which appears on the left side of the workspace. Toggle between the Data pane and the Analytics pane by clicking the tabs at the top of the side bar. 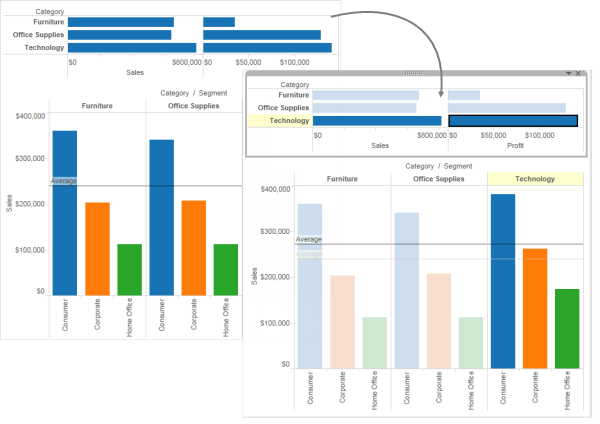 For more details, see Apply Advanced Analysis to a View (Analytics Pane). In Tableau Desktop, options for adding Analytics objects to the view are available the Analytics pane or menu, or in context in the view. For example, reference lines and bands are available when you edit an axis, and trend lines and forecasts are available from the Analysis menu. The Analytics pane provides drag-and-drop access for the various options. On the web, most Analytics objects are available from the Analytics pane. If there is an analytics object in your view, such as an average line, constant line, trend line, reference line or distribution line or band, selecting one or multiple marks in the view lets you instantly compare the analytical data for the selected marks to all data in the view. For example, selecting marks in a view that contains a trend line creates a second, recalculated trend line, the value of which is determined by the selected marks only, so you can compare that trend to the overall trend. Recalculated lines are displayed by default when you select marks in a view that already contains analytics objects. 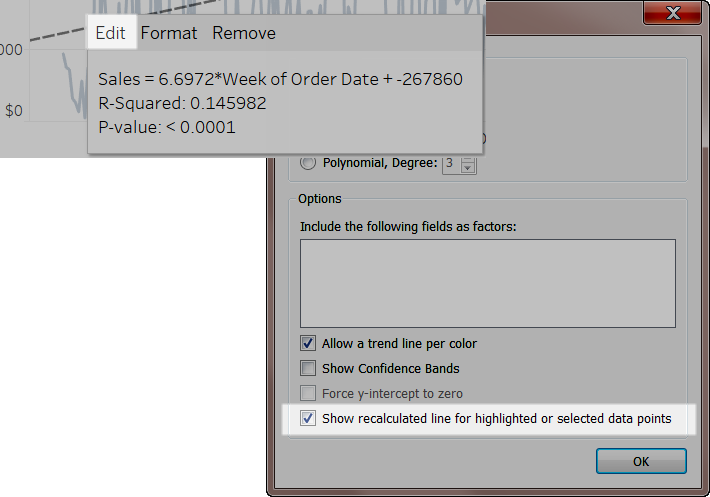 In Tableau Desktop, if you don't want recalculated lines to be created you can turn them off. Select an analytics object in the view, such as a trend line, and click Edit. In the Edit dialog box, clear Show recalculated line for highlighted or selected data points. Alternatively, you can right-click (control-click on Mac) an analytics object in the view and clear Show Recalculated Line. When you return to the view and select or highlight marks, recalculated lines will not appear. For more information about how to highlight marks, see Select Marks to Highlight. Recalculated lines also work with highlighting actions, both in worksheets and dashboards. For example, if you create a highlight action in a dashboard, selecting marks in one sheet will highlight marks in the other sheets in the dashboard. If those other sheets have trend lines, reference lines, or other analytics objects, recalculated lines will appear as the views update.